Together again in Croton, Florence Deshon and Max Eastman clashed frequently. Florence's continued outbursts of rage over Max's withdrawn moodiness were, by her own admission, "absolutely insane." The couple agreed that only a separation could end the self-destructive warfare their intense love sparked. Florence returned to Hollywood in an attempt to pick up the threads of her film career. She quickly discovered that it was not her talent or beauty that movie producers wanted. Without the publicity and glamour of a liaison with Chaplin, then Hollywood's most famous and richest star, they were no longer interested in her. When she turned to Chaplin for comfort, Florence found him cool. He was already amusing himself with another young actress from the New York stage--rising teenage starlet May Collins. Florence made three films in 1920 and only one in 1921. Her movie career waning, she kept busy with roles in plays at the Pasadena Playhouse. She had her hair bobbed and sent a lock of it to Max. He visited California again in January of 1921, and they alternated moments of intense pleasure with catlike quarrels that prompted him to call her "the Black Panther." After completing the manuscript of his book on the sense of humor, Max returned to New York in June. Within a month their correspondence resumed, only to have Florence denounce him for his neurotic selfishness. In the autumn of 1921, Florence returned to New York and booked a room at the Algonquin Hotel in the heart of the theater district. Her hope was to land a part in a Broadway play. In December, she moved from the Algonquin and subleased the apartment of Doris Stevens, who had married attorney Dudley Field Malone and was honeymooning in Europe. A militant suffragist, Stevens had shared a house in Croton with Malone, an attorney who had resigned as Collector of the Port of New York, a political plum of a job, to protest the rough treatment given to women picketing the White House. Florence Deshon's subleased apartment was in Rhinelander Gardens on West 11th Street. Photographed by Berenice Abbott in 1937. 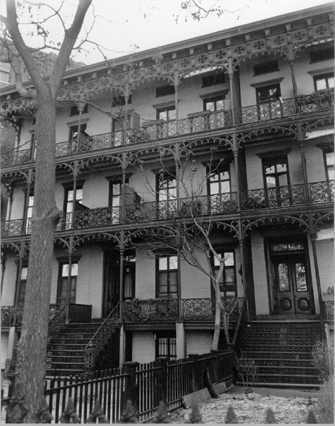 The Stevens apartment was in Rhinelander Gardens, a series of eight three-story row houses designed in 1854 by James Renwick, Jr., architect of St. Patrick's Cathedral, Grace Church and other New York churches. In Westchester, Renwick designed two churches: The Presbyterian Church in Irvington and St. Mark’s Episcopal Church in Sleepy Hollow (now the Roman Catholic Immaculate Conception Church). 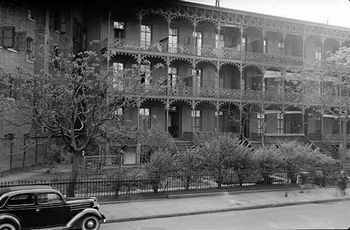 Located on the south side of West 11th Street, just west of Sixth Avenue, and set back from the street, the Rhinelander Gardens buildings featured across their fronts continuous tiers of lacy cast-iron balconies reminiscent of New Orleans’ Bourbon Street. Still fashionable, the apartments offered both gas and electric illumination, the former a blessing if the electricity failed. Detail of the cast iron balconies at Rhinelander Gardens as photographed by Berenice Abbott in 1937. According to Max, Friday night, February 4, 1922, he was attending a Broadway play with artist Neysa McMein when a man tapped him on the shoulder and whispered, "Florence Deshon has been taken to the hospital. She turned on the gas in her room. She's in St. Vincent's Hospital." Earlier that day, Max had met Florence by chance as they both emerged from the Broadway subway at 42nd Street. They walked uptown together, exchanging pleasantries. What he did not tell her as they parted at 48th Street was that he was on his way to the Scribner offices on Fifth Avenue to pick up a leather-bound presentation copy of his book, The Sense of Humor. His intention was to bring his gift to Florence that afternoon, but he fell asleep and decided to surprise her with it the next morning. Max rushed to the hospital and was told that Florence's condition was critical. A doctor asked whether he would give her a pint of his blood. Gasping for air,Florence was wheeled in beside Max for the direct transfusion. He was sure that despite her body's effort to cling to life, her will to die would triumph. "In her presence," Max later wrote of the incident, "my little personal regret about the book seemed trivial and sentimental, as I so often had seemed trivial and sentimental beside her bold, heroic, uncompromisingly passionate way of living a life." Eastman later recounted the story of their flawed romance and Florence's last moments in his 1964 autobiography, Love and Revolution. In it, he characterized her death as a suicide, attributing it to her failure to revive her theatrical career. Yellowing newspaper files, however, reveal additional details about Florence's death, including evidence that the account of the incident in his book did not match the actual events. A news story in The New York Times for Saturday, February 5, 1922, reported that Ms. Minnie Morris, described as a newspaperwoman, had returned to her apartment Friday night and detected the odor of gas. She found Florence unconscious in the bedroom of the Stevens apartment. A window was open and illuminating gas was flowing from an opened jet. A follow-up story in the Times on Sunday, February 6, reported, "None of the friends of Florence Deshon, film actress, friend of Charlie Chaplin and of Max Eastman, could find the least motive yesterday in her death. All declared the gas must have been turned on accidentally, and the Medical Examiner has reached the same conclusion." Funeral services for her were held at noon Monday, February 7, at Frank E. Campbell's Funeral Church at Broadway and 66th Street. Max did not attend. Rumors persisted, however, that she had killed herself over personal problems. Some even suggested that she had quarreled with Max. One neighbor told about a dispute that had taken place in Florence’s apartment recently between her and an unidentified male visitor. When a Times reporter contacted him, Max strongly denied the charge: "It is absolutely false. Miss Deshon was a dear friend of mine, and I am sure her death was accidental. There was no reason in the world why she should take her life, and no letter has been found or received to indicate that she did. She was healthy and happy when I saw her, on Thursday afternoon [not Friday afternoon, as his book has it], and we had an engagement for the theatre on Saturday. Please do not question me any more about it." The Sunday Times story reported that Max had gone to the hospital on Saturday morning [not Friday night], when doctors made a final attempt to revive her, and a blood transfusion was performed. It concluded with the news that at the time of her death the offer of a part in a play was awaiting her acceptance. Not long after the funeral, Eastman left on a planned trip to an international conference in Genoa, Italy, and then on to his final destination, Russia. He would remain in Europe for five years. He was trailed by many questions: Was Florence Deshon's death an accident? A suicide? How to account for the open window in February? Had the flame been lit and blown out by a draft of air? Why would the gas have been lit when electric illumination was available? And how to explain the absence of a farewell note from a young woman who regularly poured out her soul in letters to friends? The past guards its secrets well, and the big question remains unanswered: What were the true circumstances behind Florence Deshon's death? In 1955, the eight row houses of Rhinelander Gardens with their lovely filigreed cast iron balconies were demolished and replaced by an ugly green P.S. 41. For years accounts of Florence Deshon’s career and death have maintained that her grave site was unknown. Cemetery records were scoured in her birthplace, Tacoma, Washington, and Hollywood, California, to no avail. Nor was she buried in the Actors Fund plot in Kensico Cemetery in Valhalla, N.Y. or in the earlier Actors Fund plot in the Cemetery of the Evergreens in Brooklyn, N.Y. Diligent research, however, has solved this mystery. It turns out that Florence Deshon was quietly buried in New York, the city where she died. Her gravesite is in Mt. Zion Cemetery in Maspeth in the borough of Queens, along what is designated as Path 10 in the Left Section of the cemetery. Beautiful Florence Deshon was only 28 years old when she died mysteriously. She joined two other creative artists associated with Broadway and Hollywood who also died young and are buried in Mt. Zion Cemetery: satirical novelist Nathanael West, 27, and lyricist Lorenz Hart, 48, of the songwriting team of Rodgers and Hart. All three have gone too soon to that undiscovered country from whose bourn no traveler has yet returned.